New Film - When humans fall victim to their own cruel devices, enslaved on factory farms, who will survive? Australian documentary filmmaker James Hyams is out to show us what it looks like when the hunters become the hunted. When humans fall victim to their own cruel devices, enslaved on factory farms, who will survive? The scene is set. But part of the story of this film is that it cannot happen without your help. The musical scoring, the lighting, the special effects, it all costs money. For a film with such a distinct vegan message, a little help could go a long way. The project is approaching 80% of its funding goal. Check it out here on Indiegogo. Lights dim. Whirling, slightingly paranoid music ensues. A voice is heard over the chaotic screams of human beings. Imagining the opening scene of this movie is like a meat eater’s manic sci-fi vegan area is a true testament to the hook. Filmmaker James Hyams is a documentary filmmaker at heart. His projects include award-winning coverage of the dog meat trade frequently used by CARE to demonstrate its evils. But as of late, he has come to believe that the wider meat-eating community is not interested in watching documentaries that challenge their behavior. Instead, they prefer to be entertained, he writes. The message of Return of the Animals is so strong that Hyams has already pulled together a full team of filmmakers, lighting assistants, engineers, and about 30 actors on a fully volunteer basis. He says his 100-page script is still being constantly rewritten, another excellent sign. Every writer—of fact or fiction—is a perfectionist. The Rise of the Animals is meant to present the realities of factory farming to people for the first time in a completely new and slightly unsuspected format. Can you imagine how it feels to be enslaved on a factory farm? Here’s a snippet of the script. Reading the exchange between two humans seems perfectly logical. If it were two animals, it wouldn’t be so easy to understand. It’s a conversation most vegans have had with themselves, with friends and family, and more often than not, with meat eaters. Factory farming animals isn’t normal, but when meat eaters receive that simple truth from vegan, it tends to be ignored as an attack or filed away as a defense not worthy of their consideration. Because the audience is entertained by the message, they’re much less likely to be defensive. That is the luxury Hyams affords by choosing to turn fact into fiction, and the beauty of his choice is that at by the end of the film, the truth is all we will see. 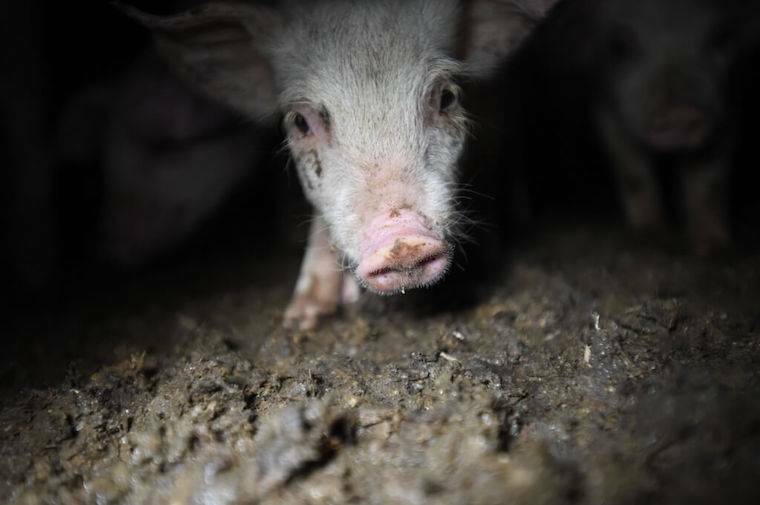 There are certain horrors in this world, and factory farming is one we might only be able to comprehend given time and space. The film will allow for both of those, and hopefully, a conversation or two in the hallway afterward. Hyams hopes to present the horrors of factory farming through a different lens, one that engages its viewers with fantastic visions of the future. But when humans become the victims of their own cruel devices, enslaved on factory farms, who will survive? In the same cages as the animals we farm, humans are forced to assume a much different perspective on factory farming. The film pushes humans to think about actually living in those conditions. To live, die, and become meat becomes a part of the human experience. Most of us have never felt what it’s like to be in a slaughterhouse. Will this change, when we see what it’s like? The numbers say it will. The more contact humans have with animals, especially animals that are or were a part of the industrial food system, the more feelings we develop for them. It shouldn’t be hard to develop feelings for our factory-farmed selves when Rise of the Animals hits the big screen. The risk this film is taking is the road less traveled. Most films about animal rights and veganism are documentary works. A divurgence from that norm would allow the film itself to garner an unexpected audience. But that’s not the point. The point is to introduce a unique vegan message where onlookers would least expect it.